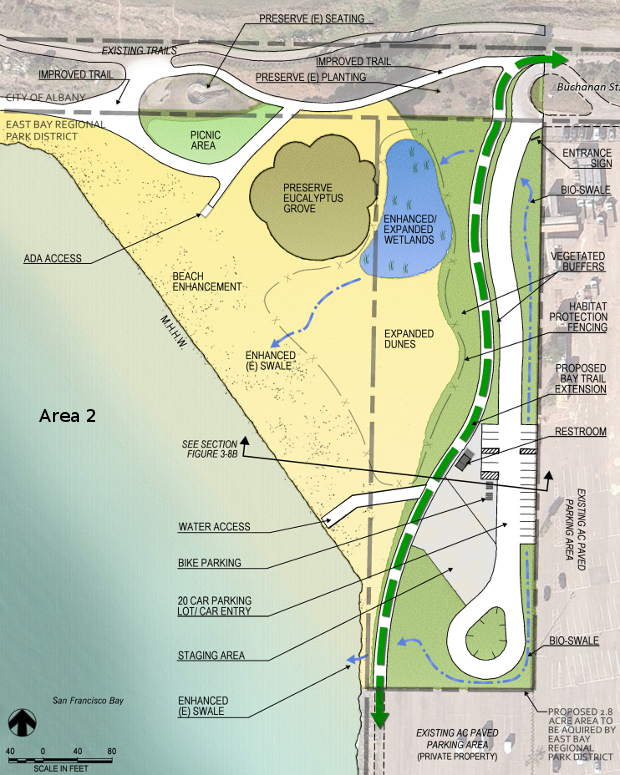 Questa, with subconsultants 2M Associates, Coast & Harbor Engineering, and Merkel & Associates Marine Biologists, is currently developing this restoration and public access plan and EIR. Phase 1 of the project involves design and permitting for stabilizing and enhancing the South Albany Neck shoreline and the lower trail at South Albany Neck, revegetating the slope below the trail with native vegetation, providing structures for sub-tidal habitat enhancement, improving trail access, and providing a picnic area at the north end of Albany Beach. Phase 2 of the project involves preliminary design of a parking lot with a non-motorized watercraft staging area, an ADA-compliant beach access ramp for pedestrians and non-motorized watercraft access, a vault-type restroom, park signage, interpretive exhibits and landscaping near the parking lot, connection of the Bay Trail between Gilman Street and Buchanan Street, and enhancing beach and dunes. All of the project facilities are being designed to anticipate sea level rise.